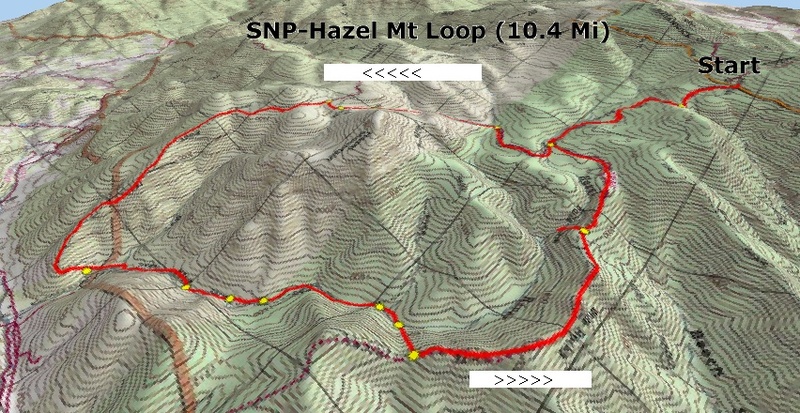 Description: This is a strenuous 10.4 mile loop through the heart of what is known as Hazel Mountain Country. 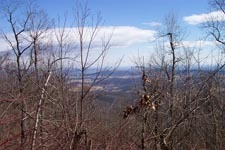 It was the last heavily settled area before it became part of the Shenandoah Nation Park. Contrary to what I’ve read, I find the trails to be enjoyable with nice views (probably best in the winter and early spring) along Sam’s Ridge and White Rocks Trails, scenic Hazel River and a waterfall and cave to visit as a focal point of the trip. This all comes at some costs. There is a total elevation gain of over 2100 feet for the entire circuit. At one point you’ll climb over 500 feet in less than 0.5 miles only to find three more false summits before you. There are 5 crossings of Hazel River not counting the one at the headwaters. These are negotiable but can be quite tricky when the water is high. Check your personal gas tank before you make the rapid 0.2 mile descent to visit the falls and cave. Remember you have to climb back up. Finally, if one can find ample parking on Rt600 at the southeastern end of the hike, where Sam’s Ridge Tr and the Hazel River Trail come together you can knock 3.2 miles off of the loop. I would still do the loop in a counter-clockwise fashion. The climb up Sam’s Ridge is quite steep from that end. Pass Hazel Mt Overlook and mile marker 33. Turn left into a small lot for the Buck Hollow and Meadow Spring Trails. Trail Notes: All trails are blazed yellow or blue. Every trail junction is clearly marked with a SNP concrete post. The Hazel Mountain Road trailhead is in the southeast corner of the parking lot. Descend from the lot and immediately pass the junction of blue blazed Buck Hollow Trail on the left. Hazel Mt Road is blazed yellow. Pass blue blazed Buck Ridge Tr on the left at 0.4 miles, yellow blazed White Rocks Tr (your return route) at another 1.05 miles also on your left and in another 0.55 miles the Catlett Mt Spur Trail on the right. Here you will cross two forks of the headwaters of the Hazel River. Continue on Hazel Mt Rd/Tr. 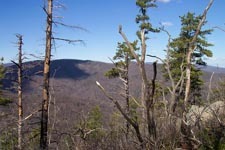 For about 0.69 miles you will climb steadily and pass yellow blazed Hazel River Trail on the left. In another 0.18 miles Hazel Mt Rd/Tr bears right (The red trail laid in by National Geographic is incorrectly located). Bear left onto blue blazed Sam’s Ridge Trail here. Soon pass blue blazed Broad Hollow Trail on the right. Along this portion of the hike you should get some nice views north and east. At 1.97 miles from leaving Hazel Mt Rd/Tr you’ll descend steeply to the yellow blazed Hazel River Trail. This junction is almost exactly at the mid-point of this trek and makes a great lunch spot. After lunch, head upstream along the Hazel River Trail for 1.31 miles. You will cross it five times. Immediately after the fourth crossing the Hazel River Trail will bear left at a concrete post and climb a hill. Stay straight, now on yellow blazed White rocks trail and cross a small tributary and the main river for the fifth and final time. climb over a series of false summits. Keep an eye out for a faint, unmarked spur trail to the left at the top of one of these summits. This supposedly takes you to White Rocks and a view of the Hazel River Valley. I saw the trail but didn’t investigate it so cannot comment on the quality of the view. All along White Rocks Trail you’ll get views north looking at Buck Hollow/Ridge and points beyond. 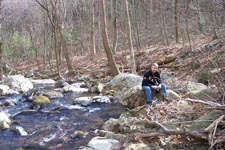 At 1.29 miles from leaving the river arrive at a concrete post marking the spur trail to the falls and cave on the left. It’s 0.2 miles to the falls and cave, most of which is straight down. 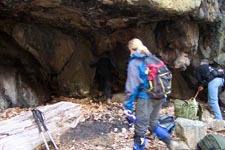 At the bottom make a sharp right and follow the rock outcrops back to the cave and falls. Return to the ridge and turn left to continue on White Rocks Trail. In about a mile reach the original junction with Hazel Mountain Rd/Tr. Turn right here and retrace the first 1.6 miles of the trek back to the parking lot. Critique: By making a couple of wrong turns on our way to the trail head at Skyline we arrived for a late start, leaving ourselves only 5.5 hours of daylight for this 10 mile loop. We figured "no problem." We did it counter-clock wise. 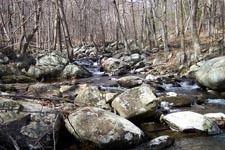 The trek down into the valley was brutal as the trail was deeply covered in leaves and the rocky terrain a real hazard. We could hear bears huffing and scraping trees around us but didn't actually see any. The multiple creek crossings were interesting and the trail up with the false summits was challenging. Our "personal gas tanks" were too empty to make it down to the water fall. We made it back to our car just at dusk. I'm open to doing this hike again but this time I will want 6.5 hours at least. Cross the Hazel River on SR600 and immediately take a sharp right turn down an unpaved road. Drive around 0.3 mile to reach the NPS boundary (there is a sign). There are only two places to park possibly depending on how willing you are to park in an active stream bed with several inches of water and plenty of tire threatening rocks. The trail head is clearly marked and you'll walk around 1.5 miles on the Hazel River Trail to reach a NPS stone post that marks the intersection with the trail that heads off to the White Rocks Trail. This trail is not shown on several mapping products I consulted but is shown on the NPS maps as well as on www.midatlantichikes.com. The climb up to the White Rocks Trail is substantial but certainly not daunting, if you hike occasionally. All the mapping products I consulted indicate that when you reach the White Rocks Trail, there will be a T intersection, with a possible turn in either the left or right direction. I did not find this to be the case although it is very possible that the turn to the right had simply been obliterated by foliage growth over time. Nevertheless, you will not find a stone post there as would ordinarily be the case at NPS intersections. The White Rocks Trail is very pleasant with a wider than normal berth through the forest. This is a doubtlessly due to the fact that it is a horse trail. In fact, I should note that all trails were blazed yellow until I reached the Sam's Ridge trail. 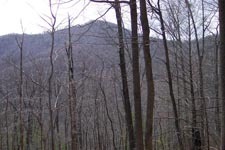 A number of mapping products I use lists, for example, the Hazel Mtn. Trail as Fire Rd (Restricted). However, I found only some sections of these trails to be wide enough for a normal sized vehicle. 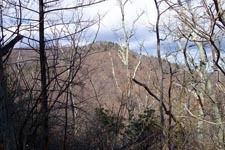 There isn't any noticeable change when the White Rocks Trail reaches the Hazel Mtn. Trail excepting perhaps the existence of what could have been bicycle or trail bike treads alongside the footprints found in soft soil. I came upon a black bear on the Hazel Mtn. Trail, but he quickly fled when I gave several long blasts on my trusty whistle. He came up on his hind paws when he and I first sighted each other, then loped back down the trail away from me and shot off the trail into the woods leaving a trail of shivering growth in his wake. I caught sight of him once again as he scrambled up the slope to my right but only briefly and he disappeared completely. The trip down Sam's Ridge was uneventful but I note that anyone wanting a good serious climb would experience around 1500 feet over 2 miles if coming up this trail segment. This is a very nice trail and the fact that you do most of the long climbing segments at the beginning is a plus. There are several nice places with vistas overlooking the park as well as what I consider to be prolific plant life. This should be a great hike in the Autumn but the winter might prove somewhat challenge with regard to vehicle access. comment: Hard long hike that starts from Skyline Drive and descends to the valley floor before looping back for a very steep ascent. 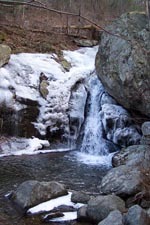 The waterfall at the top of Hazel Mountain is the main highlight. comment: Great hike! Lots of great views, stream crossings, some tough patches (steep) but all worth the effort. The waterfall and cave towards the end were really the icing on the cake.